Whatsapp user count just crossed One Billion mark within seven years of it’s launch. When it was first launched, nobody knew that Whatsapp will become such a rage. Today, whatsapp is one of those apps which you will check at least a few times, daily. Either you are chatting with your friends or sharing an update with your family group. You use Whatsapp. There are Doctors who are taking an update from their patients about their health and then there are a few very small business running on Whatsapp. WhatsApp began as a simple idea: ensuring that anyone could stay in touch with family and friends anywhere on the planet, without costs or gimmicks standing in the way. And this is true – why won’t everybody be on Whatsapp? It’s design is simple. user experience is fantastic. And, it is all for free! It does not distract you or creates hurdles by putting lots of advertisements. 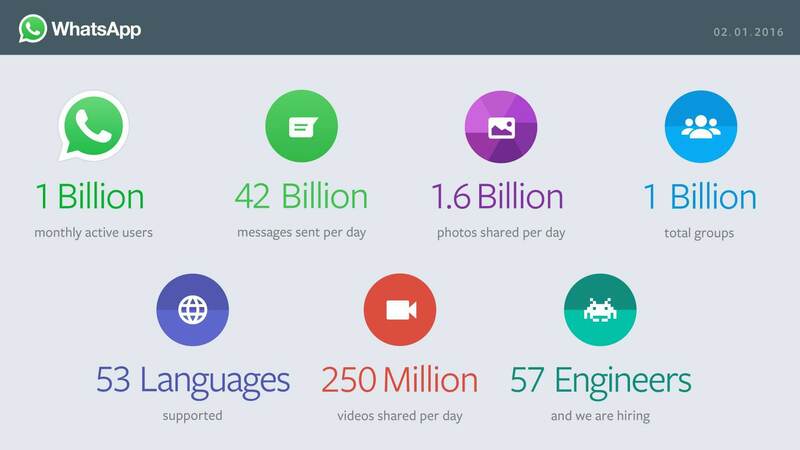 All of it has made Whatsapp one of the most used chat apps today. With Whatsapp achieving such a user count, does it mean that other chat apps will die? We don’t think that will happen soon. Though Whatsapp is really great and does what it is meant to do. But, other apps have something different to offer. Skype, for example, is one of the pioneers in cross-OS Video Chat. Hike Direct now allows you to share data with other phones without Internet, using Wi-Fi Direct technology. But yes, it does mean that other apps will have to pull up their socks and bring something great to offer to users.